The Fellowship was fortunate enough to obtain a copy of UFOLOGY #1 from BOOM! Studios. James Tynion IV and Noah J. Yuenkel write, Matthew Fox draws and Adam Metcalfe colors. Malcolm is a high schooler who, along with his dad, is obsessed with UFOs. Becky is the sheriff’s kid, and she’s resisting the idea of going to college (despite being really smart). Malcolm and his dad spend most nights watching the skies, but when something weird happens in an abandoned house on the outskirts, it’s Becky who gets there first. Without even trying, she gets that which Malcolm has always wanted. This is an amazing setup issue for this story. The focus is on the people, not the weird, and we can just assume that the weird comes later (there are hints, of course). But what really makes this a great book is the subtlety with which the story is built. It tells us things without actually using the words, and it’s done masterfully. The art helps that people focus in some really cool ways, too. I especially liked the cutout house panel. I know it’s early still, but this could very well be one of the books of the year. It’s that good, folks. 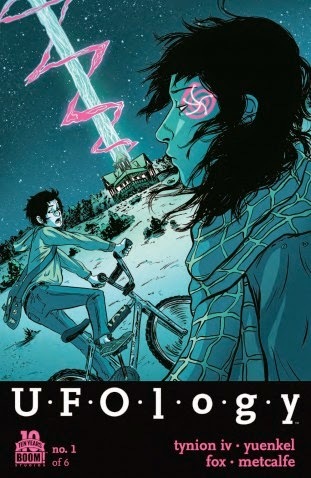 UFOLOGY #1 is available now at your FLCS or at boom-studios.com.